My office hours are at 11:00am MWRF or by appointment (it's best to give me advance notice that you expect to drop by or else I will likely depart after 10-15 minutes if no students have shown up). My office (313E Parker Hall) is a bit tricky to find. When you enter Parker Hall through the main front (north) entrance, go up the stairs. You will be in the front hallway of the 3rd floor. On the inner wall of that front hallway, between the doors for the Men's and Women's Restrooms is a large door labeled "313". My office is down the hallway behind that door. If you need to reach me via email, my email University email address is: ech0006@auburn.edu. I do my best to check this email at least once per day. Here is a tentative Class Calendar showing projected test dates and which sections of the book will be covered on which days. This calendar is subject to change throughout the semester; students should attend class to learn of any modifications. 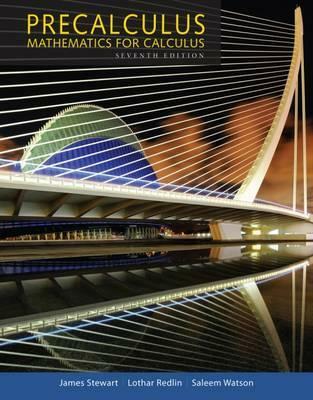 To the right is a picture of the textbook that will be used for the class: Precalculus, Mathematics for Calculus, 7th edition by James Stewart, et al. Here is a link to the MATH1150 Study Guide for MATH1150 (answers are included in the document). This is a study guide created by the Math Department in anticipation of the uniform Final Exam. The study guide is very long and comprehensive; if you can get through all of these problems and understand them, you should feel very prepared for the actual Final. The actual Final Exam will be multiple choice format (you do not need a Scantron form); it will be 35 questions long (3 points apiece). PDF file of a blank Polar Graph diagram. Below are the answer keys to the actual (not Practice) exams given in the class. Practice Exams are meant to give students an idea as to what type of problems (and roughly how many problems) will be on the actual Exams administered during the semester. Students should be familiar with all exercises from the sections covered in class, not just those on the Practice Exams. Any such problems may appear on the actual Exams. There is no formal attendance policy. You are expected to show up to class every day. Any changes to test dates or other class policies will be announced in class. There is no online component to this class; I will occasionally send emails to the whole class with announcements, but all of the material I cover is done so in class, lecturing at the blackboard. There are no formal homework assignments, but you are encouraged to look over the problems I suggest at the end of each section relevant to what we are studying. Here is a tentative list of the problems I generally suggest through the entire semester (listed by section in the textbook). I will be happy to answer any questions about such problems in class, time permitting (or at my office). I personally create and grade all regular tests for my class. You will not need Scantron forms for those tests. 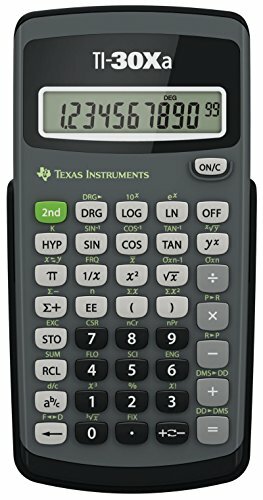 For a calculator you are only allowed to use the TI-30Xa, TI-30XA, or TI-30XIIS scientific calculators (as pictured to the right); this is a Math Department policy. This calculator is readily available at bookstores, department stores, and online. All phones must be turned off and stowed away during test periods. You should take your test with your particular class section (that is, do not show up to one of my other MATH1150 class sections trying to take the test at a different time). You suffered a "panic attack" for some reason (if your panic attack is so severe that you cannot attend class to take a test, you had better have a Doctor's Excuse for it). I am very strict about requiring documentation for missed tests. I do not require you to show up on non-tests days (although you should if you want to learn the material), but if you do not provide me with a valid, documented excuse for missing a Test Day, you will receive a 0 (zero) for the missed test and not be allowed to make it up. If you do provide me with a valid, documented excuse (and you should do your best to get this to me within a week of missing the test). Then you will be eligible to take a make-up exam for that particular test. All make-up exams will be given on the last regular day of class: 26 April. There are five regular tests during the semester, each graded out of 100 points. The dates of the tests are tentatively on the Class Calendar, but they are subject to change (I will always give you at least one week's notice of an exact test date). The Final Exam is the uniform Final given to all MATH 1150 classes in the College of Sciences and Mathematics. It will be comprehensive and also worth 100 points toward your grade in this class. The time and date of the Final Exam are also on the Class Calendar. The points you earn on the tests and Final Exam will be the only factor in determining your grade for the class. I do not "round up" any grades. Ever. If you end up with, say, 538 points at the end of the semester -- which is technically an 89.67% -- that is a B, not an A. An A is earned only if you get 540 or more points total during the semester. I do not award any points for attendance, doing homework, or class participation. You are encouraged to do all of these things (since they will definitely help you learn the material), but they are not directly part of your grade. Your grade is calculated solely from the five tests and the Final Exam. I do not drop any test grades or allow students to retake any tests. Other than a few possible bonus points on the exams, there is no other oppotunity for extra credit of any sort. I do not use Canvas to post grades. If you ever need to know your current grade in the class, talk to me after any class period or email me. Below are additional resources that students may wish to take advantage of if they feel they are not learning the material well enough just from attending the lectures every day. Of course, studying the textbook could prove valuable as well. The Supplemental Instructor program has undergraduate students who have advanced far beyond pre-calculus sit in on some pre-calc lectures, take notes, and then run study sessions for students. Regardless of which MATH1150 instructor or which section you have, you are welcome to attend any of the MATH1150 SI sessions. Students are not required to attend these sessions, but they are encouraged to do so if they feel additional instruction about Pre-calculus is needed. Students may contact the SI directly (via the email addresses above) if they have questions about the Supplemental Instruction. The Math Department offers free tutoring for most lower level math courses. The sessions for MATH1150 are in Parker Hall 320 in the afternoon at various times (click to see the flyer). No appointment is needed. Auburn University offers a Study Partners Program at the main campus library. Information about this free program is at the provided link. The Math Department also maintains a list of private tutors that are available for hire.